2 Beds 2 / 0 Baths 1,686 Sq. ft. Description: Feels just like a Charming bungalow. 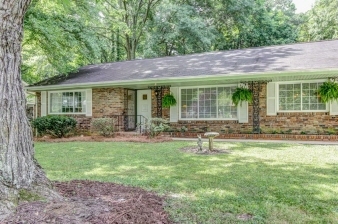 Absolutely adorable throughout, 4 sided brick with renovated Kitchen with custom pull out cabinets, stainless steel appliances, Laundry room with door leading to outside yard. spacious Large Vaulted Wood bean ceiling Den with french doors leading to wonderful level backyard, Open plan leading from Kitchen to Den , Double pane windows throughout, Hardwood floors, Formal Living Room, Separate Dining Room, Lots of bright light, Briarlake Elem, Close in Location convenient to Toco Hills, Emory, CDC.